Leon Reid's plea to IAAF president Lord Coe to compete for Ireland at the World Championships has been unsuccessful. The Bath-based sprinter wants to switch international allegiance from Great Britain to Ireland but the transfer process has yet to be completed. He has been informed that the transfer would not be approved in time for the London event, starting on 4 August. "I have not given up competing at the World Championships and have requested to run under a neutral flag," he added. 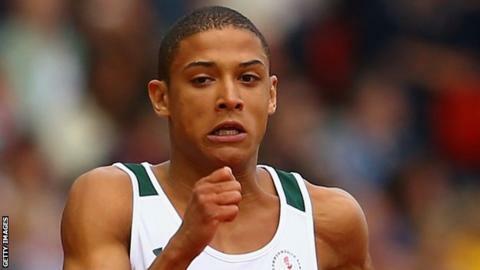 Reid, 22, who won European medals at junior and under-23 level for Britain, says he wants to run for Ireland in honour of his Belfast-born biological mother, who died last year. He competed for Northern Ireland at the 2014 Commonwealth Games. Reid's letter asks Lord Coe to help push through his transfer so he can race in London. The athlete, who has a 200m personal best of 20.38 seconds, spent much of his childhood in the British care system before being fostered by a family who have strong Irish connections. Reid's letter to the IAAF president says that the governing body's decision to allow eight Russian athletes to compete under a neutral banner in London provoked him to make his late plea. His application stalled earlier this year when the IAAF opted to halt all international transfers, pending a review, because of concerns over the number of African athletes switching nationalities.